In a late December game against the Houston Rockets, the San Antonio Spurs managed to claw back from a deficit to pull within one point with less than 25 seconds remaining. Both Kawhi Leonard and then Manu Ginobili found themselves swarmed by Houston defenders as they tried to drive. The chance of an easy basket seemed slim until Ginobili spotted Patty Mills standing quietly – and wide open – beyond the three point line. Mills took the pass and calmly sunk the three with 12.9 seconds left. It was 102-100 in favor of San Antonio, and just like that, the Rockets 10 game winning streak was snapped. His rise into the ranks of the NBA’s top players has been slow, steady, and largely unnoticed. He was picked at number 55 overall in the 2009 NBA draft, playing on average less than 4 minutes per game during his first season. Fast forward a few years, and Mills has been steadily producing extraordinary numbers which rank him not only among the best in the league, but among the best ever. Through the start of the season, filling in for injured point guard and Spurs legend Tony Parker, Mills was putting up a career high 11.5 points per game. But his efficiency tells an even more remarkable story; at one point Mills was shooting 51.3% from the field, 44.9% from three point range, and a staggering 96.8% from the line. Besides marking him as a front-runner for the Sixth Man award, these numbers put Mills in the elite company of legends like Larry Bird, Kevin Durant, and Steph Curry, members of the “50-40-90” club (50% shooting, 40% from three point range, and 90% from the foul line). It might be said that this season’s statistical explosion is merely the full flowering of a potential which Mills had revealed before. The precocious Australian averaged 14.2 points per game at just 19 years old at the Beijing Olympics in 2008. He improved this with an Olympic-leading 21.2 points per game in the London games (2012), outscoring American superstars Kobe Bryant and Lebron James. Mills continued his penchant for delivering on the biggest stage, scoring second highest in the recent Olympics – an effort which saw Australia soar to a 4th place finish. 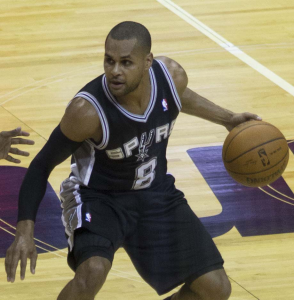 Patty Mills has a memorable personality to go with his on-court skills. Recall, for example, his taking the stage at the Spurs’ 2014 championship celebration to introduce teammate and Finals MVP Kawhi Leonard with a humorous anecdote that had the crowd roaring. The Spurs can certainly benefit from such an expressive character; recently-retired Spurs legend Tim Duncan was famous for his “boring” style of play (his nickname “The Big Fundamental” was a nod to the fact that his game centered around the mundane basics rather than flashy highlight plays). NBA reporter David Aldridge once pointed to the Spurs success as the best way to refute conspiracy theories that the NBA “rigs” the Finals to ensure that only popular and financially lucrative teams make it to the championship. Aldridge argued that the league couldn’t possibly be angling for better TV ratings by looking to the Spurs to deliver them, since their lack of crowd-pleasing highlights made them “ratings’ death!” But Mills has the personality to change that. What does the future hold for Patty Mills, and in particular, where does he rank among Australia’s great basketball players? Australia is not without its share of talented NBA stars: Luc Longley won several titles as part of Michael Jordan’s Chicago Bulls, and former #1 draft pick Andrew Bogut, once a member of the All-NBA Third team, likewise won a title with the Warriors. But Mills’ exceptional play is already leading some commentators to pose the question of whether he is the greatest Australian basketballer of all-time? His ongoing 2016-17 season almost undoubtedly makes the case that he is currently the best Australian player in the game, and if he continues this trajectory, it would be hard not to see him as the best to ever come from Australia. Yet whatever Australian basketball may owe to Mills, Patty himself clearly recognizes the greater debt he owes to his home country. As he explained to a group of schoolboys shortly after helping the Spurs to their fifth NBA championship, he is very conscious of this role: “You represent your family, mum and dad, your school and your culture…Now that I get a chance on the big stage, it’s even more important to remember where I came from.” Mills certainly remembers where he comes from, but as he racks up the points, the experience, and the NBA credentials, he continues to make a case for everyone else to remember that he may well be the best basketball player to ever come from Australia.